Intech's Disk Defrag is designed to speed up your Macintosh's access to files stored on your hard disks. Disk Defrag utility identifies files on HFS+ formatted drives which are stored in more than one place on your drive and rewrites those files so that they form one continuous data stream. This process can dramatically reduce the number of data reads and writes to access your files,thereby significantly speeding up file access related functions. 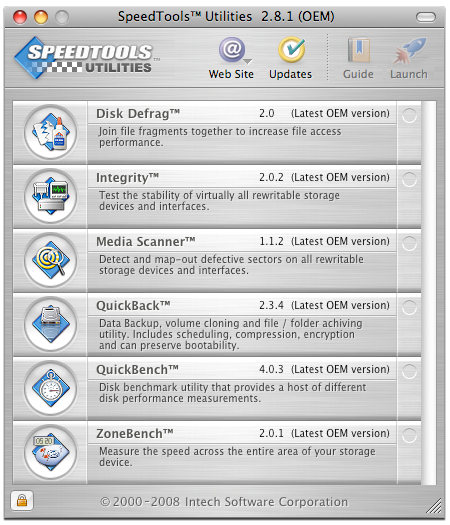 Designed to speed up your Macintosh's access to files stored on your hard disks. * One-step disk setup and configuration. * Compatible with more ATA, SCSI and FireWire devices than any other utility. * Created partitions are supported by MacOS X & Classic. * Exclusive interface-specific driver tuning options. * Built-in Extended HFS (HFS plus) support. * Convert from another utility without reformatting. * Accelerated for Power Macintosh. * Create multiple, custom-sized partitions. * Set volume level write protection and auto mounting. * Data bus Integrity analizer. * Comprehensive media testing & bad sector removal. * Supports multiple implementations of sleep. * Customize drive appearance with 3D disk icons. Qweas is providing links to Intech Disk Defrag for Mac 3.7 as a courtesy, and makes no representations regarding Intech Disk Defrag for Mac or any other applications or any information related thereto. Any questions, complaints or claims regarding this application Intech Disk Defrag for Mac 3.7 must be directed to the appropriate software vendor. You may click the publisher link of Intech Disk Defrag for Mac on the top of this page to get more details about the vendor.